Compared to other platforms audience interaction with brands on Instagram is unmatched. As a brand, it’s critical that you have an active Instagram presence. There are many approaches when it comes to leveraging Instagram to increase brand awareness, here’s what works. Engage with both your current and target audience while consistently providing content you yourself would be interested in engaging with. Don’t post any and everything. First think about three to five important aspects of your brand. Next try to weave at least one of those into each post. Create killer content and encourage engagement by asking questions, making thought-provoking statements or encouraging persons to share their opinion. Use both influencer and pay per click ads. Use successful profiles in your industry as a source of inspiration. If it’s working for them it’ll most likely work for you. While content is important, your bio, profile image, and captions are almost as, if not equally important. Your profile image should be easily identifiable, brandable and capture your audience’s attention. As for your bio, it should briefly describe what your brand is about and include your website’s link. Your captions should encourage engagement with your content either by providing your audience with a question, something to respond to or share their opinion on. It may seem obvious but many persons, aren’t doing this. Simply posting content with a generic caption isn’t going to cut it. Don’t use generic captions. Make thought-provoking statements, ask questions, ask for opinions, give them options to chose from with carousel photos. Ask for engagement and you’d most likely receive it. When you share content just displaying your product/ service with a generic caption, the responses are limited to the viewer complimenting the product or the creativity of the photo itself. When you make thought-provoking statements and ask for engagement you’re encouraging interaction between you and your audience instead of just making an announcement. Find out what interests your audience. Ask yourself, what are they following me to see and optimize for the content they’re expressing the most interest in. If either isn’t the case figure out what it is. When you have, implement it into future posts. Doing this will improve your content, and once consistently executed upon, grow your brand’s Instagram. Depending on your business, how your audience perceives your Instagram can be extremely important. People follow brands they relate to. Consistently create original, relatable content. Your audience will in most cases be more inclined to engage with content that applies to them, that they can relate to, that evokes some sort of emotion or that simply provides some sort of value to their life. Followers usually want to learn more about your brand besides your products and services. Show them that there are real people behind your brand. Using Instagram Stories would be a great way to do this. For example, share a behind the scenes look at events at your store, launch parties, campaign shoots, general work life, etc. Stories are likewise useful for gaining real-time feedback from your audience. You can do this by turning on the direct messaging feature. Or by using Polls asking questions and collecting information from the results. 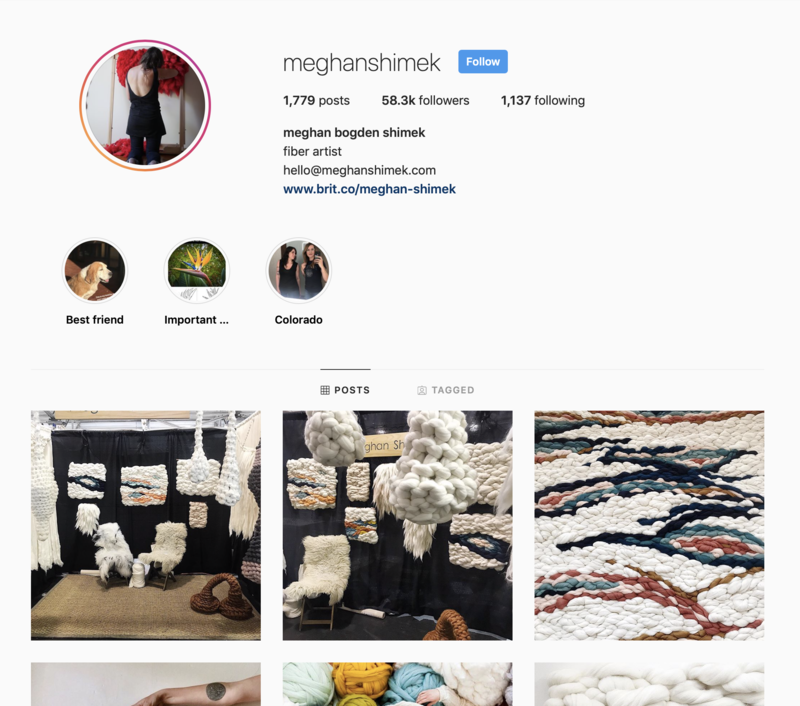 Fiber artist Meghan Shimek originally used Instagram to promote her art. Her biggest success was a huge commission by a large retailer who found her through Instagram. But it’s what she did that set her apart as a clever marketer. Followers kept asking her if she also did workshops, though she hadn’t thought about teaching before she now teaches workshops around the world. Similarly, you shouldn’t just use Instagram to promote existing products. But also as a potential source of feedback and inspiration for future ones. Hashtags can help put your business’ account in front of your target audience. Your customers search for tags related to your business all the time. Which means they’ll see what you post when you use them correctly. Once you’ve found hashtags related to your business and your area, use them in your posts. There’s a wide variety of hashtag categories, for simplicity sake, we’d limit it to the main types. Mainstream – Overused tags with hundreds of millions of posts. Eg. #like #cute #follow. Your own hashtag – This one is self-explanatory. Hashtags combined with user-generated content have the greatest effect, they create credibility and showcase your products from different angles. Always encourage persons to use your hashtag. Many people use Instagram to help make their decisions. User-generated content plays a large influence on these decisions. Instagram influencer-generated content also helps a lot in this aspect as in most cases when done right the content barely comes across as an ad but instead as user-generated content when found under your hashtag or location. If you really want to grow brand awareness with you need to start using Instagram influencer ads. Many businesses aren’t using this as yet and it’s still relatively affordable. Brands that aren’t using influencer ads are missing out on a huge opportunity to basically have today’s and ever more so, tomorrow’s new wave of celebrities endorse their brand. In terms of using tags on your own posts, stay away from mainstream tags that your content isn’t related to. Instead, use tags that are relevant to your content and your industry. Your content has a better chance of being a top post in these hashtags. You can create a list of relevant tags and comment them under your post as the first comment or use them in your caption and its almost guaranteed that your content would get more exposure. Hashtags can also be incredibly effective to find and engage with your target audience by liking and leaving genuine comments on their content. This will result in returned interactions from others within your industry, new connections and open the doors for possible collaborations. Once you’ve еѕtаbliѕhed your own hаѕhtаg, promote it tо уоur audience bу using it in the сарtiоn оf the majority of your Inѕtаgrаm роѕts and ask your customers to use it. Engage with your audience when they use your hаѕhtаg, rе-роѕt their content either on your profile or your Story. By giving recognition to your customers that use your hashtag, others will be еnсоurаgеd tо use it аѕ wеll. People are much more likely to find you not only from your posts but when others are posting about you. 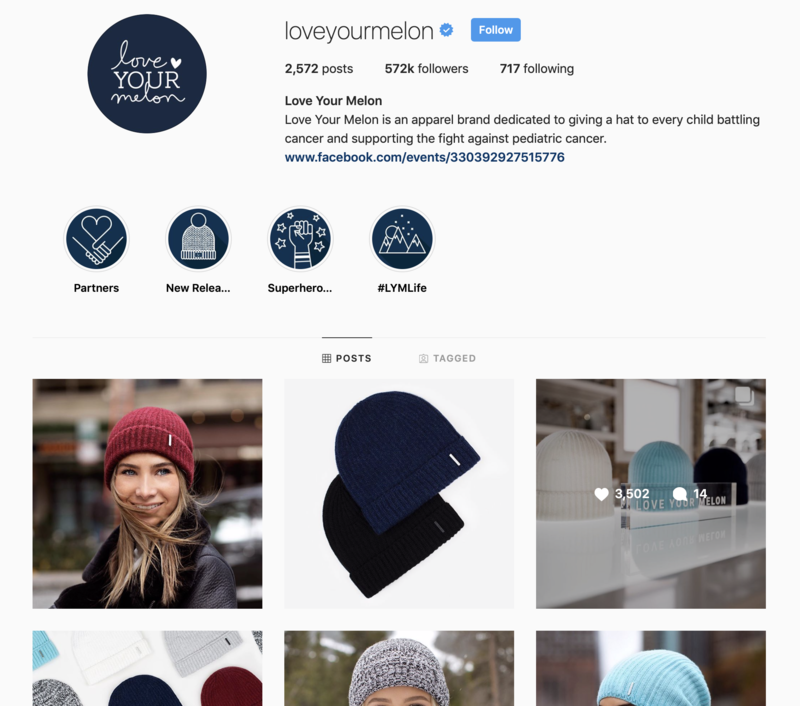 Take Love Your Melonfor example, an apparel brand, they created a brand ambassador program. In addition to their and their customer’s posts, ambassadors also created posts to promote their items. There are ambassador crews of approximately 20 students each, at over 1,000 college campuses. Each crew manages their own Instagram page. So they have more than 1,000 Instagram accounts that are pushing their products to potential costumers. The results; They’ve seen a ton of engagement and are expected to double their revenue to $45 million this year. You should also be consistent with your posts. If you share posts relating to a different topic every time, it’ll be difficult for your audience to understand what your account is about. This combined with engaging content will bring more attention to your account. When it comes to Instagram, you get out what you put in. Nothing pays off like investing in creative, original, and valuable content for your audience. Once you have engaging content and you really want to scale and build brand awareness, invest in pay per click Instagram ads. Instagram ads can be used to put your content in front of a larger, cold audience within your industry, but they’re even more beneficial for audience retargeting. The goal is to build brand awareness with your target audience and get more followers that turn into leads that eventually buy from you. You have to share engaging content for this to happen. Make it a goal to consistently share quality content with your audience. You can also make unique offers and do promotions exclusive to your Instagram followers. Do tutorials on how to properly use your products with step-by-step videos using Instagram stories. Your audience is more likely to follow you if you’re providing them with information that they can later use. Videos are becoming a favorite for marketers, third-party research predicts that 75 percent of all data will be video by 2020. The smartest marketers are putting that into action by mixing plenty of video into their feeds. Instagram says that more organizations will use social media to drive more sales. This is why they have “Shopping for Instagram” with Shopify in the US. You can use this feature to tag up to five products in your posts with links to your product. Your audience can then buy your products without leaving Instagram. Without a doubt, this feature will make Instagram the go-to shopping app compared to other social media competitors. BI Intelligence, Business Insider’s exploration division, predicts that mobile eCommerce will make up 45% of the entire U.S. eCommerce market by 2020. More customers are currently open to shopping on their cell phones, and the number will keep on rising. You need to be using stories and the swipe up feature it offers (which allows persons to go directly to your link). Instagram says Stories will become more popular. You should start creating immersive videos, post them to your Instagram stories and buy Instagram Storie ads. Instant messaging between brands and customers is taking off. Fifty-three percent of persons Instagram surveyed said they would shop with a business they can contact by means of an instant messaging application. More of your customers want to message your business instead of calling or sending you an email. Instagram thinks this pattern will continue to grow and more business and inquiries will take place via your dm’s. Trends in your industry are key to development. You need to observe this, for any brand there’s an audience that can be targeted. According to Instagram, the rise in niche audiences within industries offers the ability to make specialized products that audience is looking for.